A few weeks ago, I went on mad cookie cutter buying mission in Thyme Deli. Easter was round the corner, which meant a bunny cutter was on the cards. 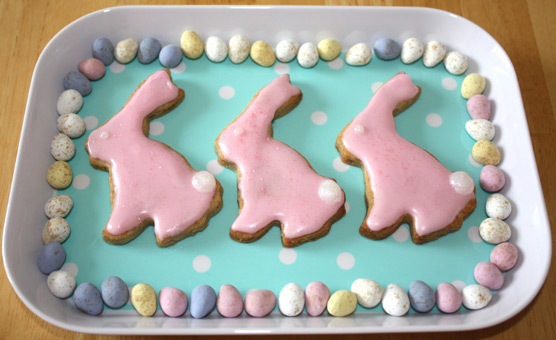 I found quite a few recipes for Easter biscuits, none of which really floated my boat. So... I created this one! On a floured surface, roll out the dough to about half a centimetre thick, and cut out your shapes. I used bunnies, but the world is your oyster. Use what ever the devil you fancy! I don't normally do cookies, but I've been on a bit of a roll with them!